Fits: Celestron 5 inch (13 cm) f/10 SCT (C5, NexStar 5) with black Allen, silver Allen, or silver Phillips factory collimation screws. Will not fit scopes with black Phillips factory collimation screws. Note 1: These knobs will fit all C5 models made prior to 2006, and all 2006 and later models EXCEPT those with black Phillips factory collimation screws. 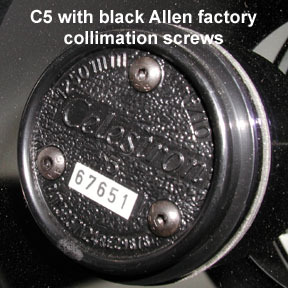 The black Phillips screw model requires C5 metric knobs. Check that our screw threads match the factory screw threads before installing.